We were looking for something kind of light for dinner, a salad or noodles or something and these cold sesame noodles hit the spot! I was inspired by this recipe on Rasa Malaysia. I changed it up a little to make it a little lighter. I also added more veggies. The recipe called for sweet soy sauce, so I used kecap manis which is an Indonesian ingredient. It worked really nicely. I would think that soy sauce and sugar would be a fine substitute for this dish. For Indonesian cooking, I think you need kecap manis! It is amazing, molassesy, and yum, you just have to try it. 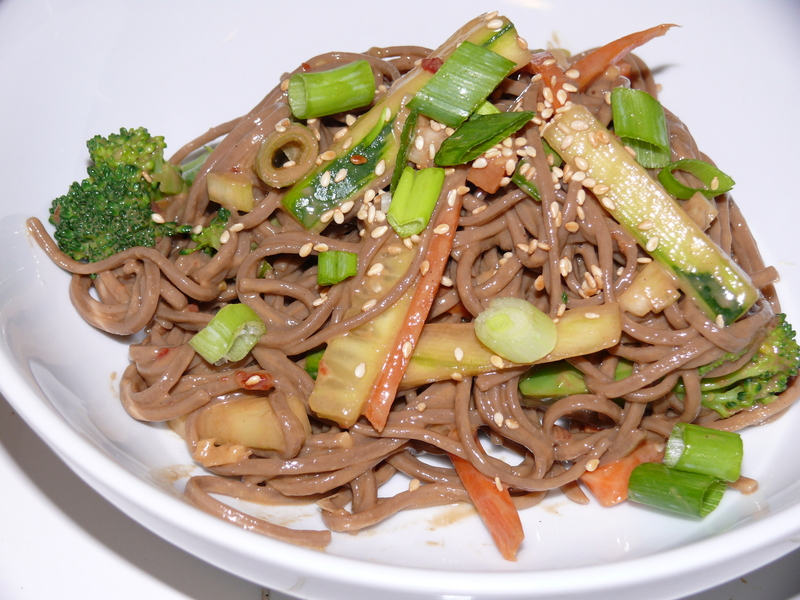 Chinese sesame paste is different than tahini in that it uses the whole toasted sesame seeds. Tahini is generally made from raw hulled seeds. There is definitely a difference, but I think you could substitute in a pinch. Rasa Malaysia suggests adding a little sesame oil to the tahini. I love temperature contrasts in a dish, therefore I think warm pan fried tofu would be really good with this! But we kept it simple and left the tofu out this time. I also think this dish is best at room temperature, not cold cold. This made about 3 medium sized servings. I end up making a lot of things in 3 servings so I can take leftovers to lunch! Heat the sesame paste and peanut butter in the microwave for a few seconds to make them easier to mix. Mix all sauce ingredients until smooth. Bring a pot of water to a boil and blanch the carrot and broccoli for a minute or so. Use a slotted spoon to scoop out the veggies. In the same water add the soba noodles and cook according to package directions. Don’t overcook. Drain and rinse with cold water. Toss the noodles with the carrots, broccoli, cucumber and sauce. Taste and add salt to taste. Let sit for 10-15 minutes and adjust salt again if necessary.